System usage provides an overview of licensing and system disk usage for uploaded files. Active Users is the total number of all users in the Active state on their user profiles. This is important to SaaS customers in terms of fees based on the active user count and to installed customers for comparison with the total licensed active users. Active Users Active Power Users is the total number of power users in the Active state. Active Users Active Team Members is the total number of team members in the Active state. Active Users Total Users is the total number of all users. 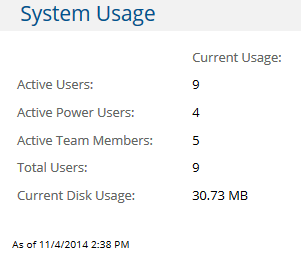 Active Users Current Disk Usage is a reference to the total disk usage for file uploads. It counts uploaded file space only, not database usage. It is important information for SaaS customers in terms of file space usage fees. It is typically unimportant to installed customers as they tend perform disk space management and monitoring for the system as a whole from the operating system level.